Iwaki Air AODD pumps are an ideal choice for the safe transfer of a limitless variety of liquids across many industries: corrosive chemicals, liquid slurries, abrasive particle slurries,viscous liquids, fuel, oils, glues, inks, and flammable liquids, just to name a few. The TC-X030 Series compact pumps offer minimal flow rates and feature the new Looped C™ Air Motor Technology (patent pending). TC-X050 series are small compact pumps with an exceptional flow rate designed to be installed into liquid transfer applications. Featuring the new Looped C™ Air Motor Technology (patent pending). Multi-port options available. 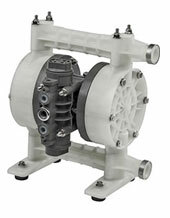 TC-X102 Series are compact pumps available only in Glass Fiber Reinforced Polypropylene (PPG) and offer a chemically resistant air section. 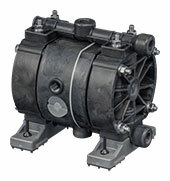 The TC-X151 pump is specially designed for frequent start/stop, dead head and high pressure type applications. 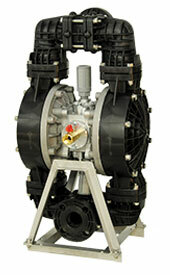 The TC-X150 pump is specially designed for frequent start/stop, dead head and high pressure type applications. The TC-X152 pump is designed to offer exceptional flow rates, high chemical resistance, improved leak prevention and increased reliability. 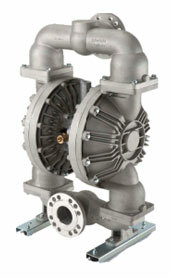 The TC-X152 series offer excellent flow rates, low air consumption and solids handling capabilities. Featuring new Looped C™ Air Motor Technology (patent pending). 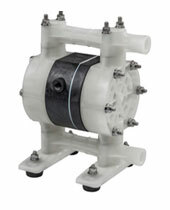 TC-X202 3/4" pumps are available in Glass Fiber Reinforced Polypropylene (PPG) with a PPG air motor section for exceptional chemical resistance. Featuring new Looped C™ Air Motor technology (patent pending). Both flange and threaded connections available. 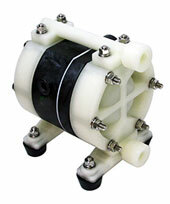 TC-X252 pumps are 1" pumps available in PVDF high chemical resistance. Featuring new Looped C™ Air Motor technology (patent pending). Both flange and threaded connections available. 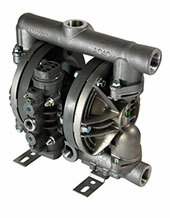 TC-X253 pumps are heavy duty, robust pumps with excellent leak resistance and reliability. They offer exceptional flow rates and solids handling capabilities..
TC-X400 pumps offer excellent flow rates and a new heavy duty body design. The pumps can operate with variable air pressures and are suited for both start/stop and fully continuous duty pumping applications. They can easily handle high pressure and long discharge lines. 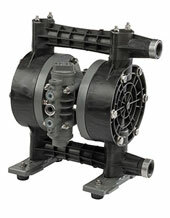 TC-X500 Series pumps offer excellent flow rates and a new heavy duty and compact body design. They can operate at variable air pressures and are suited for both start/stop and fully continuous duty pumping applications. They can easily handle high head pressure and long discharge lines. 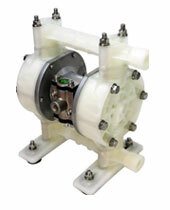 TC-XTT pumps are a special range of PTFE pumps designed to transfer highly corrosive chemicals. These pumps can also be used in some clean room-type chemical transfer processes such as in the manufacture of semiconductors.